One of the most important ways to sustain momentum to create real change is by interacting with a community. 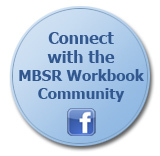 In light of this, to enhance the effectiveness of your practice and the work you do with this book, we have created a Facebook Community where people will be connecting and interacting around the MBSR Workbook. Here you’ll find like-minded people who can support you in the process of cultivating your mindfulness practice. When you arrive to the community, you’re likely to find that others appreciate connecting with you for your support, and to share, discuss, and learn more about mindfulness.